THINK YOU DON’T NEED AN OUTSIDE SECURITY CONSULTANT? THINK AGAIN. In the 21st century, most businesses have really wrapped their minds around the benefits of using an outside consultant in key areas of their business. Curiously, one area many have been slower to adopt the use of independent consultants help in is security. Perhaps security directors and managers are reluctant because they believe security consultancies offer nothing they don’t already know. Perhaps they are fearful that they will seem like they can’t handle the job they were hired to do to executive teams, or perhaps they simply think they will be too expensive to fit within their budget. While such concerns seem valid prima facie, other specialized industries have incorporated the use of independent consultants with vastly different results than these fears might suggest. For example, consider how inhibited modern medicine would be if practitioners didn’t consult specialists when their patient’s conditions called for it. In a similar fashion, high-profile attorneys never attempt to litigate substantial cases without a team of specialist attorneys on their team. With the goal of better understanding how the same principles illustrated in these examples apply to security, let’s take a look at some of the ways independent or outside security consultants can help a company’s internal security team improve security while actually saving costs. There are two general ways that businesses have successfully used our security consultant services. Either clients hire us on a per-project, temporary basis, or we work with smaller companies on a continual basis as a cost-saving measure to supplement their security team with particular specializations when needed. Project Based: This, ‘classic’ independent contractor relationship allows Enigma Security Consultants to provide specialized oversight, direction, advice, or assistance on specific projects that are either directly related to security or that have a unique security need. As Needed/Outsourcing: For smaller firms that have smaller or no internal security forces, Enigma Security can recommend and direct specialized security solutions as needed. This is a cost-efficient model for businesses who don’t have the need or budget for a full time security director. Whether you hire a security on an as-needed basis or for a specific project, the bottom line is their job is to help you lower your risk by accurately analyzing your needs. As savvy security directors already understand, you cannot be an expert in everything. Thus, bringing in an outside security consultant does not make them weak or inefficient. Rather, it makes them stronger and better able to protect their business from risks. One of the greatest benefits of using an outside consultant is that they can provide you with a fresh, unbiased perspective on security issues with your business. It’s very easy to get too close to issues and be unable to see things someone not directly involved with your businesses day to day can notice up front. 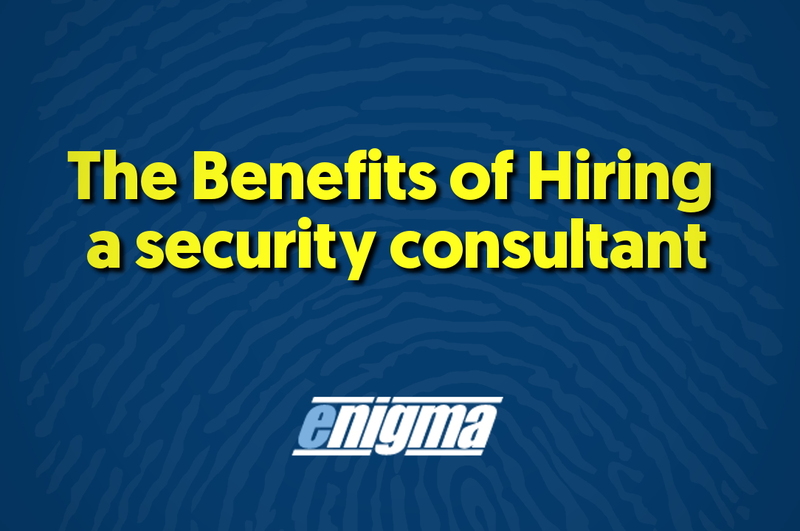 Enigma Security Consultants come with a wide array of background experience at other companies facing the same issues you are. They have the advantage of having seen other efforts succeed or fail, providing your team valuable first-hand experience at a fraction of the cost acquiring it through an internal trial and error process. Our consultants work throughout the year to stay up-to-date with the latest technology, trends, and best-practices in the security industry to provide the best advice and risk-mitigation strategies. One thing many of our clients have appreciated is the ‘neutrality’ our outside position offers. This allows us to ‘tell it like it is’ without fear of the retribution that may prevent internal whistleblowers from feeling like they can come forward about existing security issues. An independent consultant can focus solely on the security concern you need, freeing your internal lead to be able to oversee daily activities to maintain security standards. Because our consultants have so much experience implementing security measures, they are more efficient than if left to internal teams implementing such measures for the first time. There are all kinds of specializations within modern business security and it’s unrealistic to expect a single director to acquire them all. Our consultants are experts in all kinds of security issues like video surveillance, workplace violence programs, creating security plans for expansions and new facilities, etc. When your security director doesn’t have the ability to sway the executive team’s opinion on an important security manner, bringing in an objective voice from an independent consultant can validate such security concerns and help secure executive support. All of these benefits revolve around specialization and efficiency strengths that ultimately lower risk and save money. It’s important to know that the consultant you hire is qualified. Enigma Security has been family owned and operated since 2009. Since our inception we’ve been focused on helping companies prevent loss and enhance profit trough investigations, surveillance, undercover operations, and consultancy. Our Senior Management Team has both Military and Law Enforcement backgrounds. You also want to see strong signs that the consultancy is actively successful for other clients. As of 2015, we have tripled our turnover in the security sector and developed into a one-stop security solution for our clients throughout the UK and Europe. What’s more we are an ACS Accredited Company with a score of 100 in both 2015 & 2016, something achieved by only 5% of all companies. You want to know that the team you speak with when you mean a firm is representative of the expertise, experience, and talent of the consultant(s) that will work with you. As a family owned and operated business, Enigma Security has always been a value-based firm focused on building the type of expertise and integrity experts in the security sector demand. One thing to look out for is an independent security consultant claiming to be an expert in everything. As specialists in the sector, we understand first-hand how much knowledge and expertise some details of surveillance demand and that’s why we rely on a team of specialists in different areas. While your firm may be small enough to go with a single security consultant, in our experience most good consultants align with other like-minded specialists or are up front about the fact that they have a niche specialization and cannot ‘do everything’. Along the same lines, if you only need specific help in one area of security, just be up front and ask about that area. Enquire what their experience and specializations within that area are. A good team will be prepared and happy to answer such questions because they’ll want to develop the kind of trust that leads to a successful working relationship. Another thing to look for is communication. Do they communicate with you quickly as you are discussing hiring them? If they aren’t quick to act when they want your business, what reason do you have to assume they will be quick to respond when a security emergency arises? Be up front and ask them how they can help you! We are always willing to talk about the specific ways we think we can help better protect our clients and save them money. If you are talking to a consultancy that isn’t up front or can’t tell you real things they can do to enhance your bottom line and lower risk, think about moving on to look for another one. If you are a security director or the member of an executive team responsible for making the security decisions for your company, we’d love to talk to you about your specific risks and security expenses. We provide objective independent assessments of existing security solutions, specialized help on security-related projects, and as needed consultation/security management to companies throughout the UK and Europe. To learn more about us or our specific services, stick around and explore our site. If you have anything you’d like to ask or discuss, we’d love to hear from you, so make sure to let us know.